Acadia seaside cottage, 400 ft. from ocean, sleeps up to 4. Located in a nice wooded neighborhood, but yet close to everything. 4 miles from Bar Harbor, 1 1/2 miles from Acadia National Park. The cottage is very warm and cozy. 12x30 ft deck is great for star gazing in the evening and having morning coffee and breakfast with the sun. Take a stroll on the shore to look for seashells or sea glass. Watch the fishing boats go by, see the sun rise. Free transportation with Island Explorer all around the Island and through Acadia National Park and you can pick it up by the cottage, go out to lunch go shopping, have a cocktail or 2, or whatever and be dropped off practically on your door step. Runs from early morning till late evening. Even has a bike rack. Keywords: The cottage is in a nice wooded area. The shore is only 400 ft from the cottage and Acadia National Pk. is 1 1/2 miles to the entrance. If you like to take walks, you are in the right spot. Hello, my name is Karen and I was lucky enough to have been born on this most Beautiful Island called Mt. Desert Island off the coast of Maine. I got married and had a family. I have one son and 3 grandchildren. My son is a lobster men and my 3 grand children are also. 2 boys and a girl. It is a very hard job to do! Acadia National Pk. is located on the Island and it is simply breath taking. The entrance to the Pk. is just 1 1/2 miles from your cottage. So many things to do and see. There is Sand Beach in Acadia National Pk.There are also ponds and lakes around. One is just down the Rd. from you. It is called Lakewood and it is in Acadia National Pk..Maybe 3 miles from cottage. Downtown is just 4 miles away from cottage. It is a beautiful walk down to ocean is just 400 ft down the rd from cottage and a couple hundred more ft. to access shore.The shore is a rocky shore but there are places where it is nice to picnic. It is so nice not to do dishes while on vacation! Large refrigerator with ice maker and water. Toilet paper, paper towels, spices, salt & pepper, saran wrap, tin foil, garbage bags, etc. 55' flat screen T.V. on the wall. A 55' flat screen T.V. on the wall with Dish, high speed internet. There is a 26' T.V. in master bedroom. The deck is 12x30 and catches the morning sun and afternoon sun or you can set in the shade It is very relaxing! The cottage has a 55' flat screen T.V. on the wall and 2 very comfy recliner chairs that are nice to watch T.V. in or just relax and take a snooze. Cottage is very roomy and everything is provided. Kitchen is very large and has everything you will need. In a great location with easy access to all of the attractions on Mt. Desert Island. Love the little loop that the cottage is located on - very quiet and serene. The cottage is perfectly appointed. Has everything you could possibly need. Almost like being at home. Very conveniently located to Acadia, Bar Harbor and the surrounding area. It was a great home base as we traveled up the coast to Lubec as well as the park and downtown Bar Harbor. We liked the cottage so much we stayed here 2 years in a row. Thanks to Karen Candage for a great home away from home. Very comfortable cottage but sea access is restricted by need to climb down a steep cliff. Also at least a 1/2 block walk to get there and not visible from cottage. Karen was wonderful however and the cottage is very comfortable and close to the action in Bar Harbor and the beauty of Acadia. Thank you for your review. I greatly appreciate that you took the time to point out the access to the shore could be a possible challenge for some people as it does tend to be a rocky incline. It’s a situation that has never been brought to my attention. I haven’t been to the shore in many years. I am very pleased that you enjoyed the cottage and all that Acadia has to offer. I hope to see you again. I feel fortunate that I located your wonderful cottage for my visit to Bar Harbor. It is beautifully equipped, so comfortable and situated in such a lovely, quiet spot. Even though very convenient to Acadia and Bar Harbor it felt private and out of the way. I always looked forward to returning there after an active day of exploring the area. 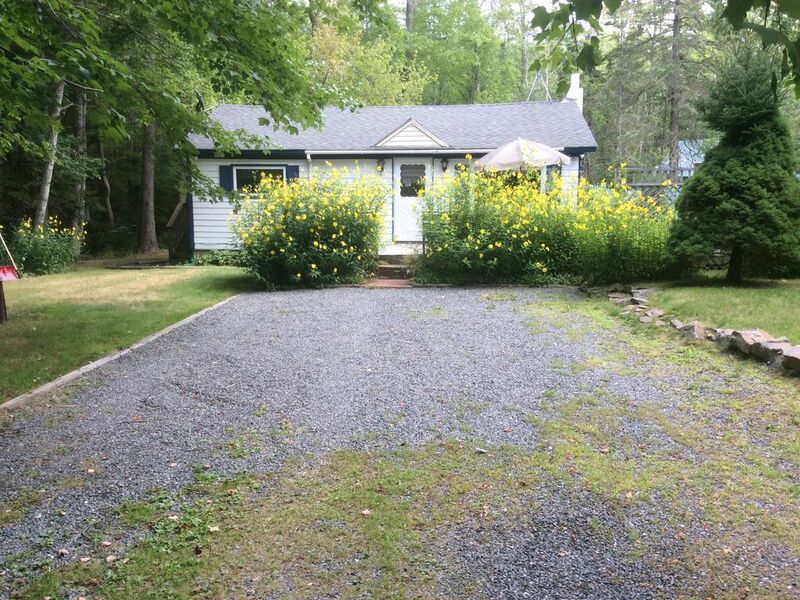 Over that past 20 years I have rented many cottages in several Maine locations. In every respect yours was outstanding. Thank you for sharing it with me. Joseph F.
I am so happy I could make your stay an enjoyable one. And thank you for taking such good care of my cottage. I hope to see you again sometime. Comfortable well appointed cottage in a great location. We enjoyed our time in Karen’s cottage. Her cabin is immaculately clean and decorated. All sorts of kitchen utensils, the grill is nice, everything is first rate. The location is very convenient to Bar Harbor and the park. I am so glad you enjoyed your stay at my cottage. And thank you for the review. They really do help the potential renter to decide. I do try to have everything you might need in the cottage. I hope to see you again sometime. We have been coming up yo Mt. Desert Island for many years and renting a variety of homes in which to stay. Karen's Cottage was wonderful, I can't say enough about how happy we were with the experience.... and I am hard to please (-:! Perfect location and the home was spotless. Karen provided anything one could need. It was so pleasant to have breakfast on her beautiful deck each morning. We will be returning! Thanks so much for writing a review for me. I am so happy that you enjoyed my cottage. I try to make it as comfortable as can be and to have everything that you might need at your fingertips. I hope to see you again soon . Acadia National Park is one of America's most Treasured Parks. It has Everything... Tall Pines, Mountains and Hiking Trails, Ponds and Lakes for Swimming and Waves Crashing on the Maine's Rock-Bound Coastline. Enjoy a Lobster Dinner in Bar Harbor or at a Lobster Pound overlooking the Ocean, Walk the 100 year Old Shore Path along the Working Fishing Harbor, Shop along Main St., try some Lobster Flavored Ice Cream or Lobster Wine. Activities: Hiking, Bicycling, Kayaking, Canoeing, fishing. Whale Watching Boats, Booze Cruise Boats, Swimming, Water Skiing, Fishing, Mountain Climbing, Sightseeing Boats, Dining, Dancing, Shopping, Movie Theater serves Beer and Pizza. The Town Band Plays twice a week in the Evening in the Village Green. Walking or Biking the Carriage Trails in Acadia. Pet friendly. I need 30 days notice for a full refund. There is a $150 non refundable pet fee. I do accept credit cards or personal checks.